Firefighters respond to fire in 13-story high rise. The study also looked at the effect of using fire service access elevators to move firefighters and equipment up to the staging floor and concluded that most tasks were started two to four minutes faster when using the elevators compared with using the stairs. The study, funded by the Federal Emergency Management Agency (FEMA) Assistance to Firefighters Grants Program and conducted in a 13-story vacant high-rise office building in Crystal City, Va., involved 48 separate controlled experiments, plus 48 corresponding computer-modeling simulations, which evaluated three types of representative fires, from slow to fast growing. "This study will result in better-informed policy and operational decisions influencing levels of staffing and other resources available for responding to high-rise fires," says Dennis Compton, former chief of the Mesa, Ariz., fire department and chairman of the board of the National Fallen Firefighter Foundation. "These are decisions now confronting hundreds of communities across the country." On the basis of the results of computer modeling, which incorporate data from live experimental burns, the study team concluded that smaller crews end up facing larger fires because of the additional time required to complete tasks. A three-person crew, for example, would battle a medium-growing blaze that is almost 60 percent larger than the fire faced by a six-member crew, which would start extinguishing a fire roughly three-and-one-half minutes earlier. In an office building, this difference is equivalent to four employee cubicles on fire for a three-person crew versus two cubicles for a six-person crew. Firefighting crew carries out search- and-rescue operation. 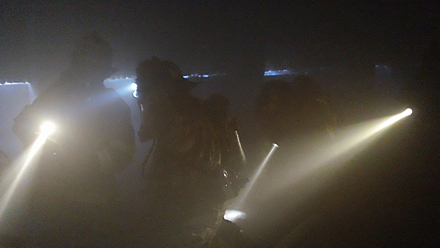 Comparing the performances of different-sized crews, the researchers found that adding two members to three- and four-person teams would result in the largest improvements in starting and completing critical tasks, such as advancing the water hose to the fire location and beginning search and rescue. Improvements ranged from one minute to 25 minutes, depending on the task. The research team also evaluated whether dispatching more three or four-member crews to a high rise fire—accomplished by sounding a higher initial alarm—would be as effective as sending a low first alarm contingent of engines and trucks staffed by more firefighters. They found that a "low-alarm response with crews of size four or five outperforms a high-alarm response with crew sizes smaller by one firefighter." "Prior to this experiment, some fire departments attempted to deploy with smaller crews on each piece of apparatus," explains Lori Moore-Merrell of the International Association of Fire Fighters, a co-principal investigator for the study. "The logic suggested that, if the fire is big enough, just send more units, but it ignores the fact that larger crews have tactical advantages that reduce risk exposure to people and firefighters. Crews of six and even five can carry out crucial tasks in parallel rather than in series. Saving time can save occupant lives and prevent firefighter injuries and property damage." Rescued "victim" is removed from the high rise. The National Fire Protection Association (NFPA) defines high-rises as buildings that are seven stories or taller, the height that exceeds most types of fire service ladders. In most U.S. communities, new high- rises are required to have automated sprinkler systems, which are designed to control the spread of fires, not to extinguish them. But according to the NFPA, 41 percent of U.S. high-rise office buildings, 45 percent of high-rise hotels, and 54 percent of high-rise apartment buildings are not equipped with sprinklers, as compared with 25 percent of hospitals and related facilities. Moreover, sprinkler systems fail in about one in 14 fires. As a result, Averill says, "fire departments should be prepared to manage the risks associated with unsprinklered high-rise fires regardless of whether a building is actually sprinklered." High-rise buildings now dot the U.S. urban, suburban and even rural landscapes. While concentrated in large cities, such as New York with 6,543 skyscrapers and buildings seven stories or taller, Chicago with more than 2,300, and Phoenix with about 175, high-rises are also common in smaller metropolitan areas, according to the building inventory maintained by Emporis. For example, Omaha has about 70 buildings seven stories or taller, Fargo, N.D., has 22, and Gulf Shores, Ala., has about 65. While much less frequent than house fires, about 43 high-rise fires occur in the United States every day. Between 2005 and 2009, according to the NFPA, high-rise structure fires averaged 15,700 annually. Average annual losses totaled 53 civilian deaths, 546 civilian injuries and $235 million in property damage. "Rather than providing a one-size-fits-all answer, our study provides a scientific basis for discussions in communities as they consider matching resources deployed to their particular risk levels." says Averill. 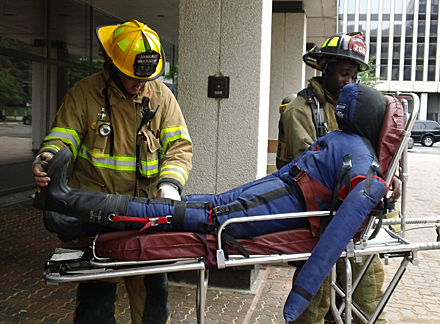 "Until now, high-rise staffing, deployment and even operational decisions have been based on decades of applying trial and error strategy and tactics," says NFPA's Russell Sanders, a retired Louisville, Ky., fire chief. "Tragically, the fire department standard operating procedures and industry standards that we have today have, in many cases, been established at the high cost of civilian and firefighter lives: the science to prove these policies, procedures and standards as the best practice has been absent." Sanders says NFPA consensus committees will use the results of the new study as they update safety and best-practice standards for firefighters. **The Report on Residential Fireground Field Experiments [NIST Technical Note 1661] can be downloaded at: http://www.nist.gov/manuscript-publication-search.cfm?pub_id=904607.